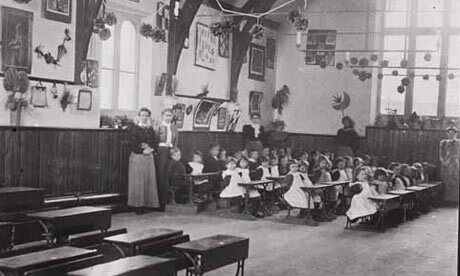 What a complex and fragmented collection of schools existed in 19th Century England. Voluntary philanthropic initiatives, struggles between the Anglican church and Dissenters, middle class reformers, business interests, and public schools for the gentry – all based on a laissez-faire principle of non-interference by the state in the workings of the free market. But eventually the struggle to develop mass elementary and then secondary education resulted in a recognisable national ‘system’ even though class, race and gender expectations structured provision. And now, in 2015, we are going backwards! A sort of market has been encouraged by governments since the late 1980s, through Thatcher-Major-Blair-Brown-Clegg/Cameron-Cameron. Financial and other management devolved to schools, ‘choice and diversity’ leading to competition, then academies and free schools run by religious, business, charitable and parental groups, and with business-dominated chains of schools, now comprise what is in no sense a ‘system’. Schooling is fragmented to the point where we have the most unequal outcomes in terms of social background than any of the richer countries. Teachers are now ‘managed’ as a disposable workforce, and children tested from an early age more than any in the world. Is anything new in this backward looking world? Well yes, and it isn’t all positive. The arrival of ICT means that schools and their personnel are now controlled in ways 19th century managers could only have dreamed of. Major’s government managed to ‘diversify’ schools (eg specialist schools and grant-maintained), aimed at taking schools out of local authority influence, and the CTC’s brought in business and a profit motive. SATs and league tables helped generate inter-school competition rather than co-operation. Under New Labour, city academies (later just academies) became a major plank in government strategy. Combining several agendas – a diversity of schools, more religious schools, improving inner city schools, reducing local authority powers and bringing in private money, around 300 schools became academies under New Labour. Ostensibly aimed at rescuing ‘failing’ urban schools, New Labour’s ‘modernisation’ of comprehensive schools set the stage for a full fragmentation and eventual privatisation of education under Conservative governments. After 2010 the incoming Coalition and then Conservative governments aimed for all secondary and then primary schools to become academies, supported by relentless pressure from Ofsted to declare schools failing. Tactics to re-establish hierarchies of desirable schools include allowing the remaining 164 grammar schools to create ‘annexes’ (the first is ten miles from its parent school), and the invention of ‘free schools’. A more honest name would be free-market schools funded by taxpayers, a novel and as yet unexplained policy with no clear direction or coherence. Private schools have even been allowed to convert to tax-payer ‘free’ schools – presumably a vote-winner among parents who no longer have to pay hefty private school fees. Around 230 free schools at election time are to be joined by 500 more. Religious and business groups certainly found sponsorship as lucrative and influential as in the 19th Century. There are now hundreds of unelected people on these boards and frequent revelations of financial ‘irregularities’. The legitimation for academies was always that they ‘raised standards’ and ‘transformed the lives’ of disadvantaged children but evidence for this has always been dubious and manipulated (see The growth of academy chains, The chain effect: the impact of academy chains on low income children, and If academies are the answer…?). Now even the UK Statistics Authority questions DfE claims. So back to ITC and the use of data. In the nineteenth century, teachers, charged with ‘civilizing’ the urban working class, were themselves constrained and controlled in their dress, religious observance and personal conduct . They were policed by inspection, and ‘paid by results’. Now teachers’ daily work is inspected and controlled by internal managers and external inspection. Homework submitted and marked electronically, lessons plans submitted electronically, data on attendance and progress reported electronically and teachers expected to be available at all hours for emails from managers, parents and children – all this has made the labour of teachers relentless to a point way beyond nineteenth century expectations. Not just payment, but the survival of teaching careers and whole schools, now depends on ‘results’. Competitive comparisons between children and schools could not be carried out without ICT. 18th century philosopher Jeremy Bentham invented ‘panopticon’ designs for prisons, where a small number of guards could oversee prisoners’ every movement. Schools are now run as digitalised panopticons. How far backwards can we take schooling? This entry was posted in Governance, Uncategorized and tagged academies, comprehensive schools, history, local authority. Bookmark the permalink.